Kevin’s wedding is days away and his Dad needs a decent tuxedo. But before making any final purchases at an upscale men’s store, the two have a few things to get straight. So to speak. _Shiny Pair is coming to the Universal Theatre Fest in P-town! _The fifth annual short play festival, with Playwrights, Actors and Directors from across the country. 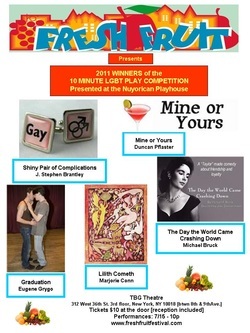 First place winner in the 2011 Fresh Fruit Playhouse short play contest! July 15th, 2011 at 10pm! Ten dollars at the door.